In all engineering disciplines, mathematical models are required to describe the reality surrounding us. The goal of System identification is to compute these models, based on real-life measurements on the system of interest. Instead of making assumptions on the physics of the system, one relies on actual observations, which results in a very pragmatic way of working. the linearization of nonlinear dynamics around a periodic steady state solution, which results in a linear system with periodically time-varying coefficients. The left block diagram in the figure below gives a graphical representation of the corresponding direct model. to develop new estimation algorithms, analyze their stochastic properties, and adapt them to be applicable to real-life cases. to design and perform experiments on time-varying systems, for example, an electronic circuit with time-varying resonance frequency and quality factor. E. Louarroudi, R. Pintelon, and J. Lataire (2012). 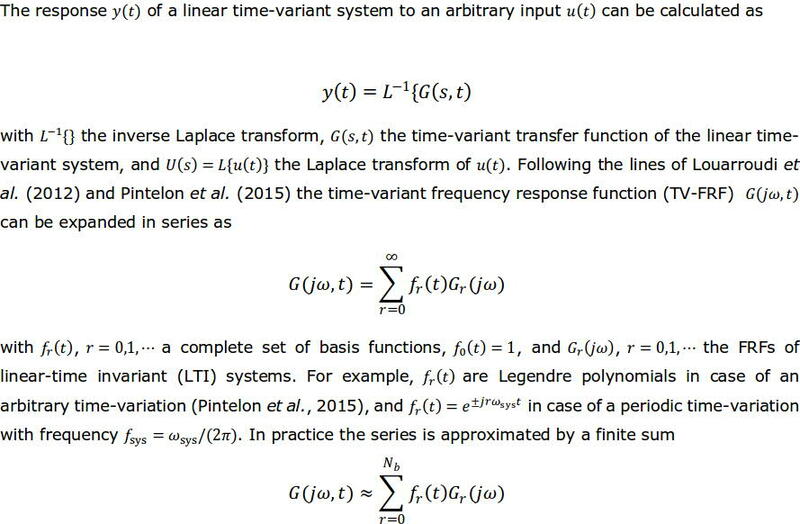 Nonparametric tracking of the time-varying dynamics of weakly nonlinear periodically time-varying systems using periodic inputs. IEEE Trans. Instrum. and Meas., vol. 61, no. 5, pp. 1384-1394. R. Pintelon, E. Louarroudi, and J. Lataire (2015). Nonparametric time-variant frequency response function estimates using arbitrary excitations, Automatica, vol. 51, no. 1, pp. 308-317.